The minister got the honour of filling the barrel, which was decorated in golden colour for the occasion. “The spin-offs created by Statfjord can hardly be exaggerated. Generating more than NOK 1,500 billion in revenues and 200,000 direct and indirect man-years since the 1970s the field has been of great importance to the Norwegian society,” says Arne Sigve Nylund, Statoil’s executive vice president for Development and Production Norway. He took part in the celebration on Statfjord A. After Statfjord has been on stream for more than a generation Statoil and its partners still have a horizon until 2025 for the field. 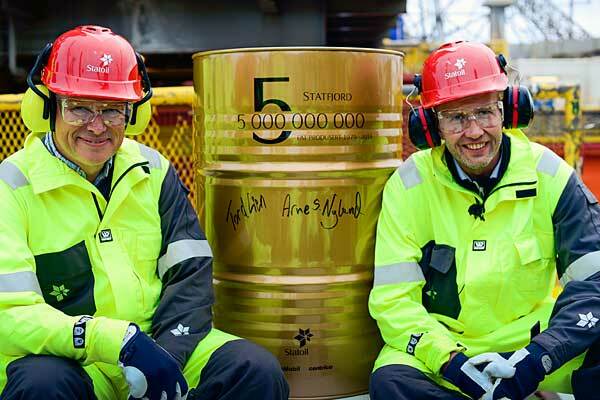 Originally the partnership hoped to recover 40% of the oil at Statfjord. The result so far is record-high 67%. The additional resources recovered beyond what was initially believed to be possible equal the lower production estimate for Johan Sverdrup. “On this is a historic day we take a retrospective view. This, however, is also a story about the future, describing how knowledge, skills and experience acquired through many years across the oil industry are harnessed to create ever more values and new activity. Statfjord was supposed to be shut down more than ten years ago. Instead technology development, smart solutions and clever decisions have extended the productive life and increased the level of activity. This is characteristic of Norwegian oil history and something we will build on in Statfjord’s next chapter and on the NCS for many decades to come,” Nylund says. Thanks to active subsurface work, efficient drilling and well operations, and well operated installations Statfjord this year successfully increases production for the fourth consecutive year. 451 wells have been drilled on the field, and more than 40 years after the field was discovered new profitable wells are still being drilled. Safe and efficient operations are essential to optimal resource recovery. At Statfjord the drilling costs have been reduced by 50%. Overall more than one million metres have been drilled at Statfjord, roughly corresponding to a round trip from Oslo to Stavanger. Statfjord is still producing oil. However, the most important decision after the turn of the millennium was made in 2005. Through the Statfjord Late Life project the field was converted from an oil field to a gas field by reducing the reservoir pressure. A bold decision by the partnership, and a successful implementation with important contribution from the suppliers. NOK 23 billion was invested, and production was maintained during the conversion process. The work included the drilling of 70 new wells and extensive modifications to the platforms. Statfjord field partners: Statoil Petroleum AS (44.34% – operator), ExxonMobil Exploration and Production Norway AS (21.37%), Centrica Resources (Norge) AS (19.76%) and Centrica Resources Limited (14.53%).